It’s at around this point that I start thinking “Why on earth did I decide to write something about the quantum eraser?” As if wavefunction collapse and wave-particle duality weren’t hard enough concepts to get your head around at the best of times, introducing the quantum eraser and quantum entanglement will probably make your brain implode completely. I know mine did, and still does every time I read about it. I make a lot of sacrifices for you guys, okay? You’ve got your double-slit experimental setup as described last week, where there’s a stream of electrons/photons/whatever passing through a pair of slits and interfering with themselves (not like that) while they’re in wave mode to produce an interference pattern. Putting a particle detector at one of the slits will force the photons to act like particles instead of waves, collapsing the wavefunction and causing the photons to only go through one slit instead of both. Measuring which slit the photon went through is known as obtaining which-path information, and it’s this that the quantum eraser and its variations attempt to manipulate in a number of different ways. The first variation is to simply try to erase this which-path information from the photons and see if we can get them to behave like waves again. The actual quantum eraser setup is ludicrously complicated and I’m not going to describe it here, but in the abstract it’s a fairly simple step of merging the photon paths back together after they’ve moved through the slits so that your earlier which-path information is no longer relevant. Wikipedia uses motorways for its analogies but I prefer hamsters running through a series of tubes, which I just came up with because I find hamsters to be inherently absurd creatures. 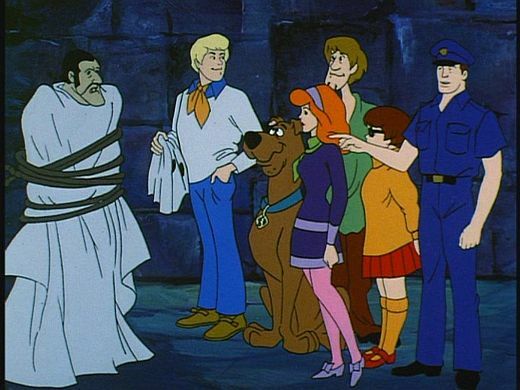 So that’s very basically what your quantum eraser does; it smudges out that which-path information you got by firing the hamsters through the slit by mixing up their splattered remains so that you can no longer tell which body parts came from which hamster. It turns out that if we do this to photons and not hamsters, erasing the which-path information like this will indeed cause the photons to start behaving like waves again and restore the interference pattern we’d expect to see if they were waves. Easy, right? It gets somewhat murkier when you start dealing with quantum entanglement. This is a term for what happens when you create a matched pair of quantum particles that have interacted physically somehow; a typical example is both particles being radioactive decay products from the same parent particle. Radioactive decay is a process that has to follow the conservation laws just like anything else, and so any child particles produced from the parent particle have to have the same net attributes as the parent particle. The most commonly used example is spin because it’s easy to understand and you don’t even have to know what particle spin is; essentially if the parent particle has spin 0 and one of the child particles has spin 1, the other child particle must have spin -1 in order to conserve spin during the decay process. We don’t know what exact spin the first child particle will have when we measure it, but we do know that whatever it is the second child particle must have the opposite. If one particle is spinning clockwise, the other must be spinning counterclockwise. These cases of quantum particles having complementary properties are known as entanglement. Quantum entanglement can lead to some fairly weird phenomena, not least of which is Einstein’s “spooky action at a distance”. You see, since the quantum properties of each of the entangled particles are inherently bound up in one another, measuring one particle also in effect measures the other particle at the same time. Measuring quantum particles causes them to behave like particles and not waves. So if you have one of a pair of entangled photons inside a double slit apparatus, and the other one somewhere completely isolated from the experiment – the Moon, say, or Dover – and you measure the isolated photon, its entangled partner will immediately begin behaving as though it too has been measured and its interference pattern will disappear from the double-slit set up. This sort of thing is actually quite useful for the quantum eraser setup, as it allows experimenters to futz with the photons making their way through the double slit apparatus without ever touching the double slit set up itself; a typical quantum eraser uses polarizers to “mark” which slit a photon has passed through, destroying the interference pattern, but if a complementary polarizer is placed in front of the photon’s entangled partner that mark can be erased and the interference pattern restored. It also lets us (apparently) mess with the laws of causality, using something called the delayed-choice quantum eraser which looks like this. Not even going to try to explain all that, but what the delayed-choice variant of the quantum eraser does is let us choose whether or not we mark or erase our entangled photons after they’ve finishing wending their way through the apparatus and have hit the detectors at the far end. That immensely complicated setup is an apparatus which splits photons coming out of the double slits into an entangled pair. One of the entangled pair goes straight to a detector do. The other one gets bounced off a complex series of beam splitters that essentially give it a 50% chance to go one of two ways and eventually ends up at one of four detectors d1-d4. 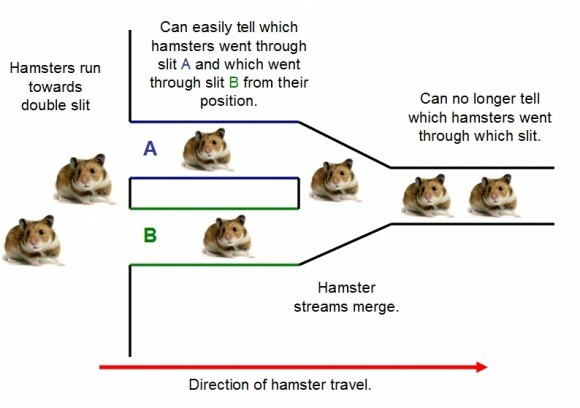 Because of the way the beam splitters are set up only two of the detectors yield information about which of the two slits the original photon passed through, while the other two merely indicate that it could have come from either, erasing the which-path information just like the hamster tubes earlier. 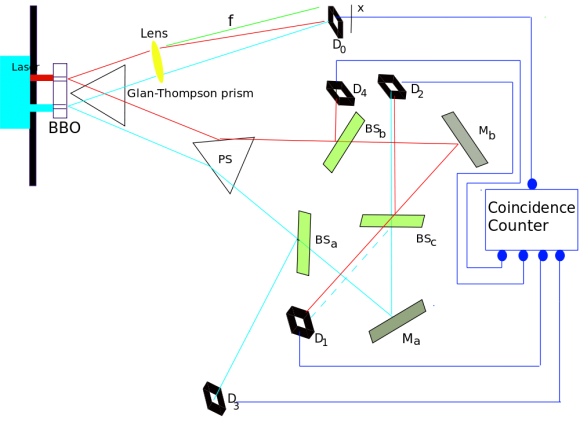 Finally, the link between each pair of entangled photons is recorded by the various detectors; it will always be known that a certain photon that went through the beam splitters and ended up on the third detector d3 is entangled with another specific photon that didn’t go through the beam splitters and instead went straight to the original detector do. Now, the photons that end up at do don’t have any which-path information determined for them directly. That information comes from their entangled partner going through the beam splitters. However, because photons that end up at do go straight there instead of bouncing around a bunch of beam splitters they travel along a shorter optical path, which basically translates to “they show up there first”, before the entangled partner which does contain the which-path information is detected at d1-d4. They enter the detector before any measurement information about them is obtained. And yet when you match up the pairs of entangled photons and look at the set which have discrete which-path information, all the photons at do which have which-path partners show no interference pattern. All the photons at do which don’t have which-path partners do show an interference pattern. And this happens despite the photons at do having no way of knowing which detector their entangled partner was going to hit because to them that was an event that was going to happen in the future. In effect, measuring the which-path information at detectors d1-d4 has affected an event that happened in the past. CRAZY PHYSICS. This is awesome. I just about nearly understand it and it is very very funky. Also, Quantum. Thanks, I always wondered what my brain would look like if it melted out my ears. Oh come on, Erasure isn’t *that* bad.